New York–based multi-disciplinary studio, BREAKFAST, has unveiled a groundbreaking kinetic facade product dubbed "Brixels." The use of kinetic panels for facade and interior design has rapidly grown in popularity both domestically and abroad recently, animating visuals and opening new paths for natural ventilation. Each display is composed of an array of brick-sized pieces that are fully customizable in terms of massing, material, and finish. 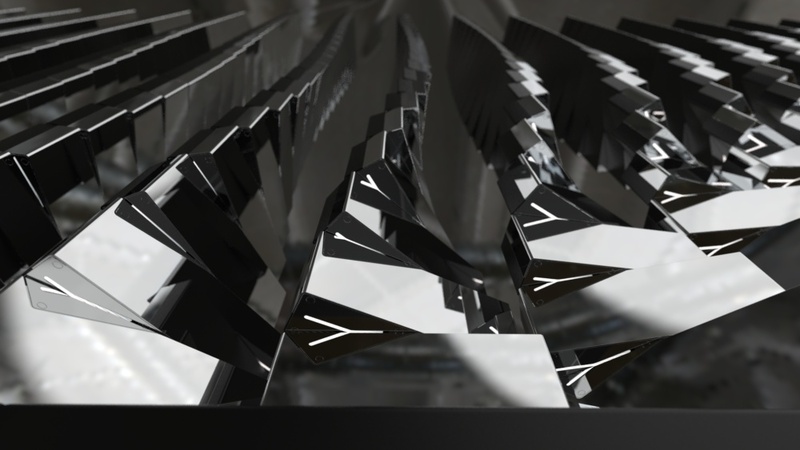 Through a central cavity, each individual piece is latched onto a central support shaft, which allows the objects to rotate in either direction. At the base of each central support shaft, BREAKFAST has inserted a series of printed circuit boards that are in turn connected to a Linux control computer. Through visual sensors, the installations can track and respond to adjacent physical movement or can be controlled directly through a web-based application. The multidisciplinary studio tested out their new technology with the 19-foot wide by 6-foot tall installation dubbed Brixel Mirror. Made of polished aluminum and matte-black steel, the pieces are capable of achieving 60 rpm via an app or one-on-one control. While Brixel Mirror is the most significant application of the technology-embedded material to date, Andrew Zolty, BREAKFAST’s co-founder and head of design, has big ambitions for the product. According to Zolty, the customizability of the interactive blocks allows them “to become part of the space, rather than an add-on, used to outfit or become interior walls, room dividers, fences, railings, or even building facades.” Brixels have been tested to withstand the elements outdoors; a building can be entirely clad in sprawling, perpetually moving paneling. 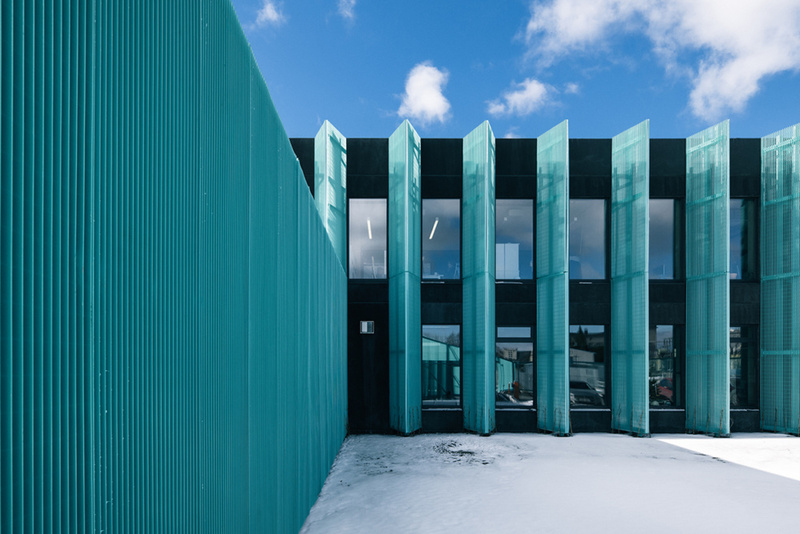 Estonia-based architectural practice molumba has enlivened a suburban office block with a unique concrete and aluminum screen assembly. The project was commissioned by AS Elering—the nation’s largest transmission systems operator for electricity and natural gas—as a dramatic, three-fold expansion of the preexisting structure in Mustamäe, a southwestern neighborhood in the nation’s capital of Tallinn. Over 140 turquoise mesh piers ring and visually buttress each elevation, a play on historical castellation and Gothic design found throughout Tallinn’s Old Town. The piers are built of full-length aluminum strips measuring 12 to 41 feet, which are in turn welded to a series of connecting bars. Each pier possesses its own steel support structure consisting of two internal, vertical columns fastened to the welded connecting bars. The design of the complex references the spindly and bundled power line, a ubiquitous feature across urban landscapes. AS Elering operates a multi-acre electrical substation next door. According to design lead Karli Luik, molumba envisioned the project as “the brain of the electricity and gas transmission network, monitoring and administrating their vitally important circulation.” As a vitally important aspect of Estonia’s energy infrastructure, the entire 40,000 square-foot complex is ringed by a perimeter wall fashioned of the same turquoise aluminum screen. For molumba, the bigger question was how to give the mesh triangles a truly functional quality outside of their aesthetic elements. The two planes of the piers form an acute isosceles triangle: the two congruent sides measure just under four feet while the base is approximately three feet. This shorter edge is placed atop the building’s 20 by 10 foot black precast concrete panels and wedged between window openings. With a 41-degree circumcenter angle, the piers function as effective passive sun shades for office functions within. Additionally, the mesh frame serves as an industrially-produced lattice screen for future vegetative growth to coil up the facade. The interior, designed by Stuudio Oü, features a design that similarly echoes the building's utilitarian function. Spiraling stairwells, built of concrete and steel, vertically course through the east and west elevations of the headquarters, while exposed pipes, cables, and pendant lamps made of recycled insulators line the ceiling and walls. A central vegetated courtyard and a two-story, wood-paneled stairwell, with steps of varying size, are the office block's principal communal areas. At the core of it all lies the "Brain," where the nation's energy transmission network is surveilled through a hippodrome of monitors. The newest major addition to Northwestern University in Chicagoland, the 415,000 square-foot Kellogg School of Management’s Global Hub, establishes a formidable cornerstone for the campus’s border with Lake Michigan. 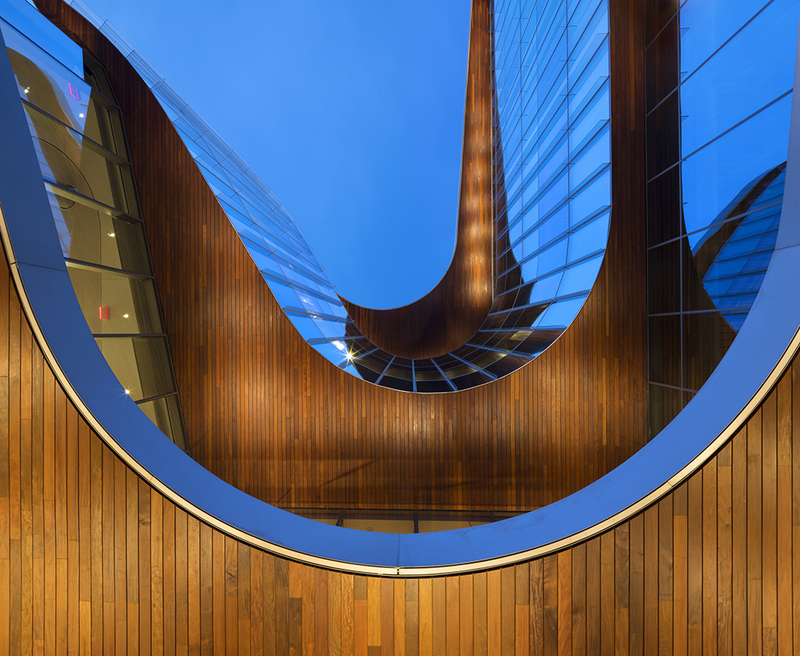 KPMB Architects, a Toronto-based firm with a significant background in sustainable institutional design, addressed the region’s weather extremes with a well-executed layout and an undulating triple-glazed glass curtain wall. 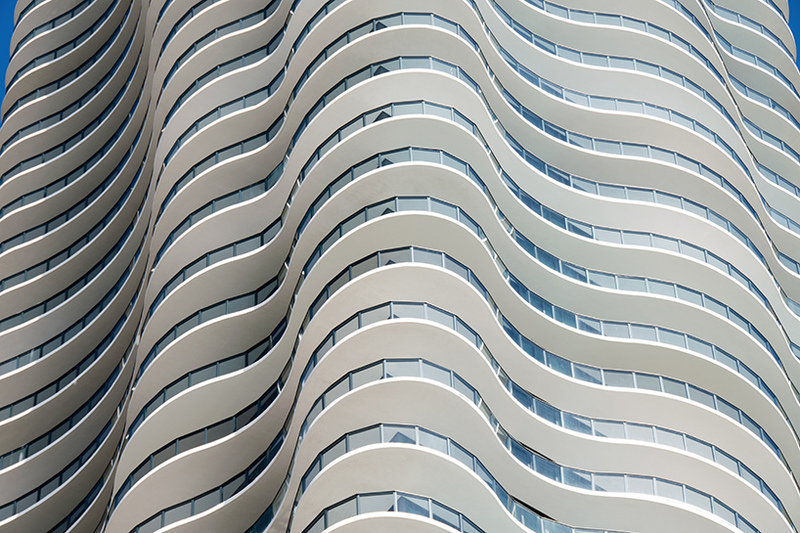 According to Senior Associate Kevin Thomas, the first inspiration for the building’s six-story curvilinear form is the rolling movement stemming from the adjacent Lake Michigan. The nearby shoreline stabilization system, composed of boulders and precast concrete, has been consistently smoothed over by wave patterns. For KPMB, “the use of glass helps break down the mass of the large structure while maximizing visual connections to the adjacent lake and Chicago skyline." The 160,000 square-foot curtain wall is designed with horizontal and vertical anodized aluminum mullions, and a reflective glass coating. 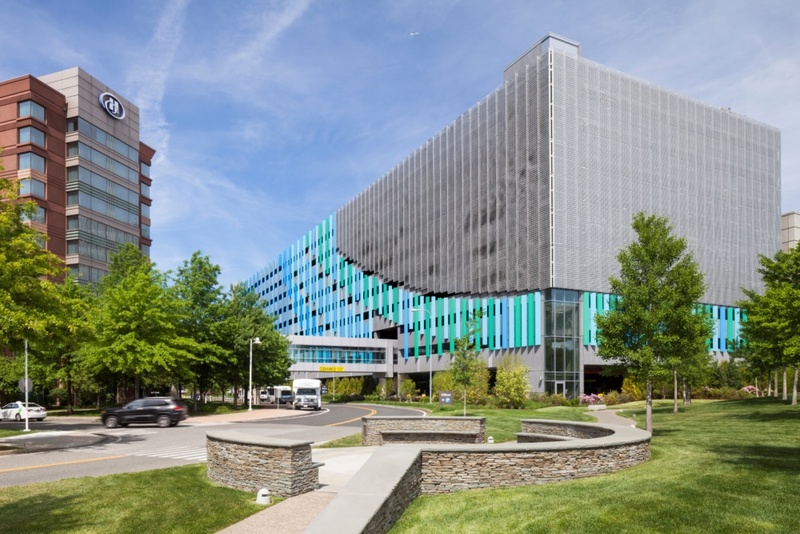 While sections of the facade are curved, the design team worked closely with the manufacturer to incorporate narrow curtain wall modules and vertical glass fins at every frame to blur hard edges. Each triple-glazed glass panel is tied to the structural frame with modified steel angles painted to match the curtain wall and aluminum anchor hooks. The result is a sweeping surface that simultaneously reflects other wings of the building and the ever-changing environmental conditions. Although glass panels of various sizes are the primary material element, KPMB Architects added certain details to diversify the dominating blue-green color palette. The elevations are unified by reddish-brown Brazilian walnut soffits that crest and wrap around the building. Brazilian walnut, a hardwood, was chosen for its durability and minimal maintenance. The Global Hub’s layout consists of four wings, perceived by the design team as independent buildings, rotating around a centrally placed atrium. Swooping white balconies, interconnected by pale-yellow wood bridges and an expansive two-story stairwell, are the main conduits of interior circulation. The glass curtain wall and a band of rooftop clerestories, clad with high-performance translucent glazing, flood the interior with natural light without significantly producing thermal heat. 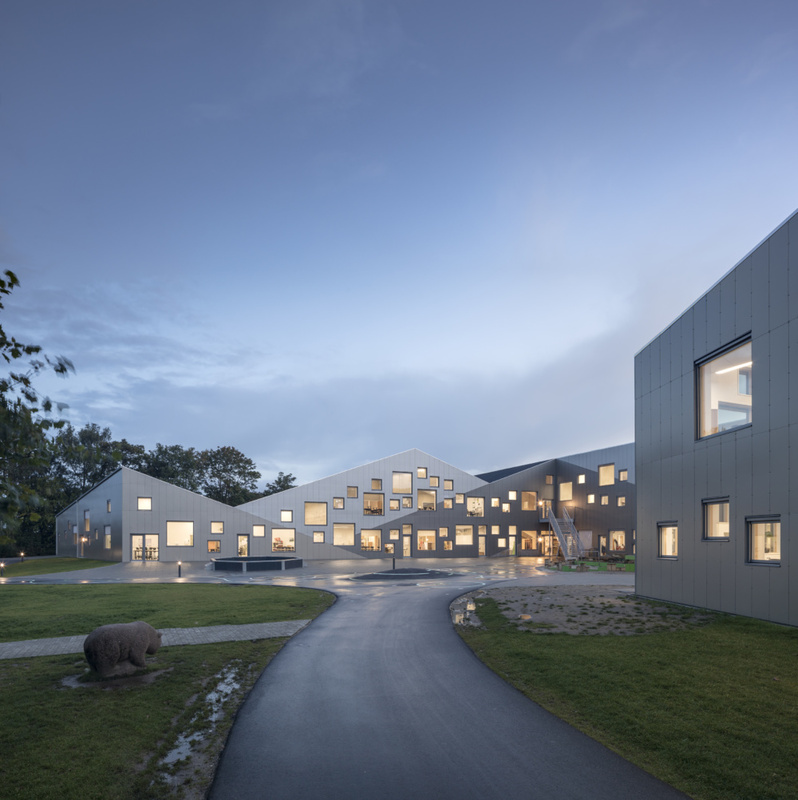 The project, part of KPMB Architects' long-running collaboration with Transsolar KlimaEngineering, was designed with a number of features to boost environmental performance. These measures include a geothermal energy system embedded beneath an adjacent football field, a ventilation system that circulates fresh air, and an automated shading system. In 2018, the Global Hub received LEED platinum certification. The provincial capital of Mérida is located on the northern edge of the Yucatán Peninsula, a region noted for its distinct Mayan culture, and nearly two-thirds of the city’s population is indigenous. Mérida’s Spanish core consists of a broad range of colonial architecture built of locally sourced limestone, much of it ripped from Mayan structures. 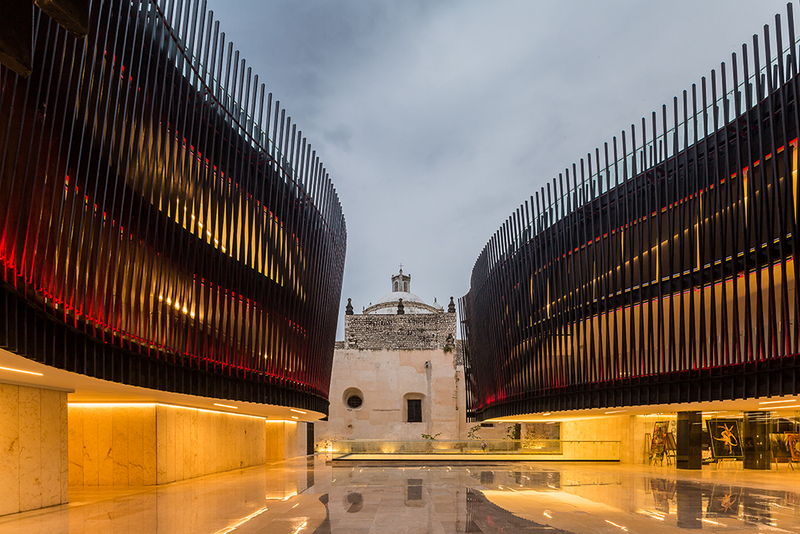 Seen from above, the nearly 100,000-square-foot Palace for Mexican Music is organized around a U-shaped courtyard, called the “Patio of Strings,” which faces the rear elevation of the four-century-old Church of the Third Order. A series of newly constructed alleyways rhythmically break the solid stone mass to provide routes of entry between the courtyard and the complex’s library, museum, and concert halls. Mayabtun Marmoles, a local stone supplier, harvested local Yucatán limestone, referred to as Crema Maya or Macedonia Limestone, for the project’s cladding and flooring. The panels, measuring 4 feet by 1.5 feet, are embellished with a polished or hammered finish. Each panel is fastened to the complex’s steel frame with aluminum holding brackets produced by Sistema Masa While the use of local building material is a direct visual nod to the physical character of the Centro Historico, the design team went a step further with the facades' stone and fenestration pattern. The vertical bands of stone are meant to serve as notational bars while the glass panels are notes from the popular Yucatan folk song, Esta Tarde Vi Llover. The 444 matte-black steel ribs are the defining element of the north elevation and courtyard. In both areas, the 30-foot hollow-steel ribs are fastened to an exterior rail that is in turn soldered to a series of corbels that protrude from the floor plates. Corridors within the courtyard are semi-open to the elements, wrapped by a glass balcony and sheltered by the stone-clad steel frame. To shield this area from sunlight, the steel ribs break into two planes, one vertical, the other slanted. For the four-firm team, the design of the Palace for Mexican Music is an attempt to "establish a new precedent for a public building to contribute to the revitalization of its surrounding space" through the use of contextual contemporary design and accessible public space. After a rigorous research and design process, their final execution has achieved that goal. Morris Adjmi Architects has just completed its wedge-shaped 363 Lafayette mixed-use development in New York City. The project is located in the heart of the NoHo Historic District, a context known for its mid-rise store-and-loft buildings clad in detailed cast iron and stone. From October 25 to October 26, The Architect's Newspaper is hosting its Facades+ conference in Los Angeles for the fourth year in a row. The conference features leading architects based in Los Angeles including Heather Roberge, principal and founder of Murmur Architects; Tammy Jow, associate director of AC Martin; Thom Mayne, founding principal of Morphosis Architects; and Stan Su, director of enclosure design at Morphosis Architects. To learn more about emerging facade technology, wider industry trends, and what's on the boards at Morphosis, AN sat down with Thom Mayne in the firm's New York office. The Architect's Newspaper: When did you start getting interested in facade innovation, and what do you find most interesting about it today? 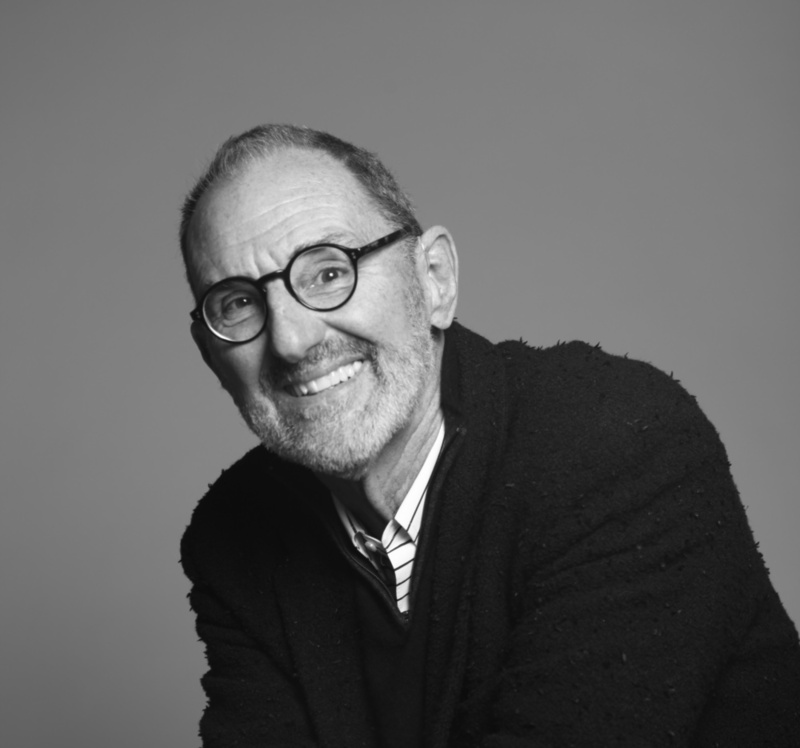 Thom Mayne: It started in the early 2000s; we were working on a project in Seoul, on the Sun Tower. We were investigating the possibility of a second skin, an artifact that was much more connected to an aesthetic formal exercise because it freed us of the norm of a window curtain wall and the whole notion of facade. We had a continuous surface and that allowed us a lot of freedom in a completely different direction. After that, we were working on the Caltrans project in Los Angeles and the General Services Administration (GSA) project in San Francisco. Both were very distinct projects that required real thinking on performance, using facade openings and scrim walls to take advantage of natural light and exterior temperature conditions. The whole thing became a huge exercise in environmental performance. We saw it as part of our responsibility to represent architecture within a state-of-the-art context in terms of its use of energy. It is not something we're focused on, but there's nothing that comes out of the office that doesn't require some level of environmental facade performance. When we opened the GSA building, Nancy Pelosi was there and she didn't like it. She likes Victorian architecture, and I said, “Nancy, actually this is how it works, and you have to understand its performance,” knowing that she’d agree that our values are parallel. In fact, that’s interesting too, that the average person relates to a building just in terms of its appearance. It's fairly straightforward. In reality, the skins had to do with weight and their ability to move and their technological performances. It wasn't about the metal; we didn't start it by wanting to do a metal building. It's a result. In terms of the metals, I think the Bloomberg Center at Cornell Tech was quite successful. We're experimenting with textures and imprints on metal, and in that case, it resulted in a set of random pieces and it looks like it's dynamic, in a perpetual state of movement based on the reflection of the sun. The facade’s 500,000 perforations are stationary, but if it looks like its moving, it’s moving. We used metal skins at Cornell Tech, but we are sort of done with the whole metal thing; we want to move on since people link us with metal buildings. What are you working on and what do you think we'll see in five years? TM: We are pursuing a couple other projects making the skin active and literally dynamic, which presents another set of possibilities. It just keeps changing the whole notion of facade. A large segment of the profession today is recognizing completely new opportunities. We really pushed environmental performance with our recent work, the Kolon One & Only Tower [in South Korea]. It's a state-of-the-art research and development center with a sophisticated west-facing fiber screen wall. We found much more aggressive subcontractors in Korea and China. Here [in the United States] they just think, “Haven't done it, can't do it.” Outside of the United States, contractors and clients are more willing to experiment with new materials and techniques? TM: It is really weird as we're still the wealthiest economy in the world; we're in a place that’s affecting architects for sure, but creating very timid architecture. You're staying competitive if you are creating intellectual capital. We couldn't have done it in the States or for an American client; it would’ve been too aggressive or too risky on their end. [The Kolon tower] was very much moving the ball forward just advancing kind of this notion. Again, it's this one single element, the exterior wrapper that you see in the work. Unlike other projects, we never set out to make a stainless steel building, even though it withstands weather and it'll be around in 100 years. The response [for Kolon] was to various performance demands. What it does is allow a completely different reading of the work because you get singularity of the surface. What facade and construction innovations do you think we’ll see in the forthcoming years? TM: Without question, there'll be a continuation of technologies that produce more efficient envelopes. New materials and increased performance characteristics will drive a lot of it. Design becomes less of a focus of your work. I would also question the question. I think today, there isn't a lot of attention to the future since it's hard enough to grasp the present. The whole idea of the future is also that it is kind of unknown. And the answer is, I don't know. At Cornell Tech’s Bloomberg Center, we were discussing where they are going with the program, and they responded, “We don’t know; we are going to put a biologist, a poet, and a mathematician together and invent projects.” And you go and talk to Google’s design group and ask what they are doing? Same thing, “I don’t know.” We are going to put certain people together and find something interesting. There's more of that process going on and it makes sense; continued thinking and progressions in material and integration. Construction techniques and the ways we build other large complex objects, such as automobiles, are open to significant investigation. Advances in prefabrication allow for the efficient mass production of “handmade” pieces and the continual reworking of materials. For certain contemporary projects, like Kolon One & Only Tower, to get the desired form, shaping, and performance of the facade components, metal is no longer as useful due to its heavy weight. That [investigation beyond metal cladding] is definitely going to continue as we expand our material language. As you work on certain projects within the studio, they take on their own life. So I already know we're interested in pursuing that again with a similar material and technology because it's going someplace that we couldn't in other work. It's giving us a very different look and a different direction at the same time. It's opening up coloration and a different palette, because we wore out metal. We have to say, “After number six or seven, let's move forward.” We're doing it differently because we have to do it differently. It's not that we couldn’t continue to do it in perpetuity, they're actually operational. It's more a desire for something new. You founded Morphosis in 1972 as an interdisciplinary practice. How have the firm’s artistic tangents informed your design projects? TM: As part of the visual culture, drawings, paintings, sculptures, objects of all types, including furniture, all share many types of connections in the design world and in their formal structures, and they're, to me, singular. The artistic tangents are dealing with organizational ideas, compositional ideas that feed directly into the work. If you can look at a lot of [our tangent projects], you're going to be able to see absolute connections between organizational strategy and material connections. It's all part of a visual world that interconnects—the drawings and the abstract work become precursors to the work itself, that is, the architecture. The different mediums allow you to explore different formal ideas free of contingency. It's free of the pragmatic forces whether it be functionalities or economics. It allows you to explore it as a pure idea, which is useful mentally. You need the freedom to explore ideas in a much purer kind of framework outside of contingency, because if there's anything difficult in architecture, it's the limits that restrain a certain amount of freedom necessary to explore an idea. But I would say on the other hand, those same limits are what architecture is about and are useful. It’s a balance between constraint that gives you clear focus on a problem and other constraints which are just annoying or which are just limiting. Going back to our earlier discussion of where certain things can take place, like we discussed with Kolon in Korea, I just need an environment that’s a little freer and open to just explore ideas. It's a constraint I need to remove. This other artistic work is just to think freely, but those ideas absolutely find their way into the work. They're absolutely interconnected. When I come back to my office this artwork is abstract urban design and the strategies of urban thinking. Further information regarding Facades+ LA can be found here. The Massachusetts Port Authority (Massport) has big plans for Boston's Logan International Airport, ranging from the modernization of Terminal E to the expansion of adjacent runways. In 2016, as part of these modernization efforts, Boston-firm Arrowstreet delivered a dynamic expansion of its West Garage featuring a kinetic aluminum facade. Facade Manufacturer EXTECH Exterior Technologies, Inc. Facade Installer Ipswich Bay Glass Co. Located adjacent to the I-90 and the Logan Airport 9/11 Memorial, the site is highly visible to the nearly 30 million passengers that pass through the airport annually. The objective of the project? To deliver an easily assembled second skin capable of obscuring the structure’s utilitarian purposes while simultaneously providing outward views from within. According to Arrowstreet Principal David Bois: “The movement of air currents, a critical component of aviation, provided inspiration to the design team, the individual movement of the panels provides a visualization of air movement and a constantly changing facade.” Faced with a tight schedule, Arrowstreet recognized that the screen wall had to be fastened to the garage in a straightforward and adaptable fashion. The facade system is composed of 353, 11-by-5-foot panels that are Z-clipped to individual galvanized hangars, which are epoxy bolted to the precast concrete garage. Because of the Z-clips, individual panels can be rapidly removed from the overall structure for ongoing maintenance and inspection. The kinetic element is composed of six-inch curved aluminum squares that can move in the breeze. The 50,000 individual flappers are connected to the frame by a series of stainless steel rods and nylon spacers that allow the flappers to spin with the least amount of friction possible. With minimal resistance, the panels move even during minimal wind conditions. Below the moving aluminum flaps, Arrowstreet placed tiered rows of multicolored fins to provide the structure further luster. The design concept was modeled in Rhino and Revit, and the team was able to simulate the kinetic movements of the system for various panel sizes. After Arrowstreet tested a broad range of panel sizes, the firm exported the models for custom fabrication by exterior specialists, Extech. Linetec finished the flappers with their Class I clear anodize. Prior to installation, Arrowstreet installed a full-scale mockup onsite to test installation procedure, functionality, and resiliency. Furthermore, a section of panels and flappers were transported to Intertek’s architectural testing facility to undergo hurricane simulations to evaluate the resiliency of the fabricated prototype during extreme weather conditions. 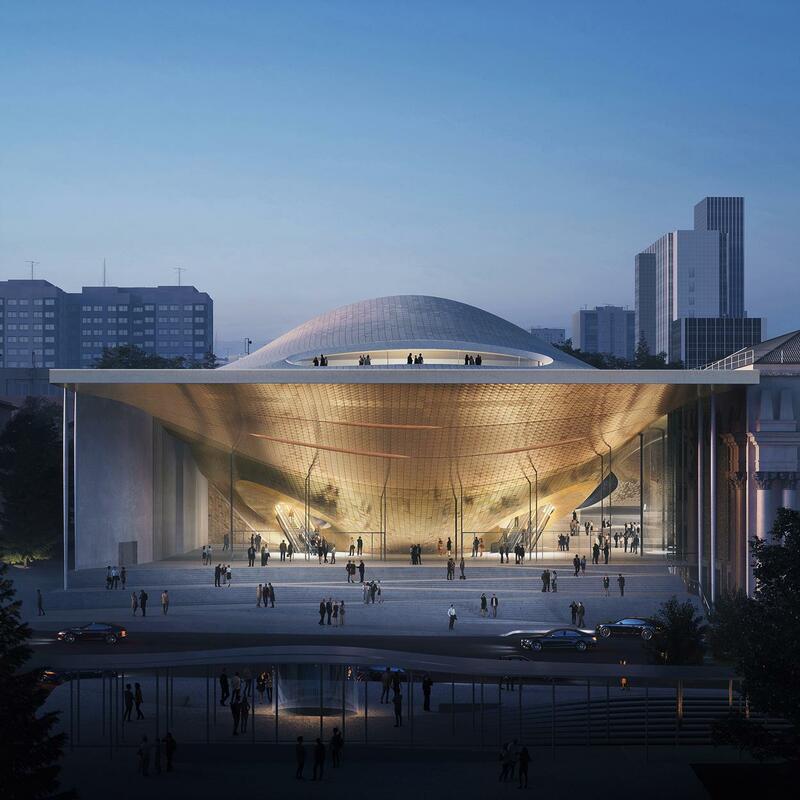 Zaha Hadid Architects has been chosen to build the new Sverdlovsk Philharmonic Concert Hall in Yekaterinburg, Russia. The city of Yekaterinburg, home to the world-renowned Ural Philharmonic Orchestra, has established itself as a cultural and artistic center of Russia. The Philharmonic is known for its sold-out performances in the existing Sverdlovsk Philharmonic building, which dates back to 1936. 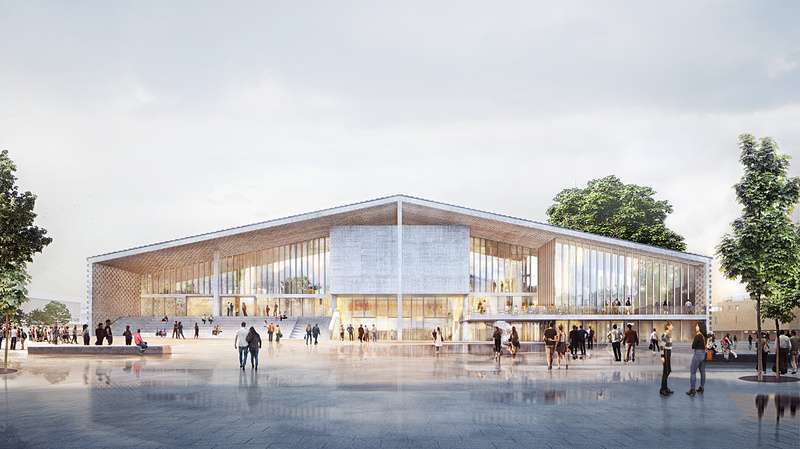 The orchestra’s new home will serve as an inspiring auditorium and public plaza for the people of the city. The new Sverdlovsk Philharmonic Concert Hall is characterized by its flexibility, unpredictability, and audacious architectural aesthetic. The design of the building was inspired by the physical characteristics of sound waves: floors, walls, ceilings, and canopies seem to flow, vibrate, and intertwine with one another in effortless and continuously smooth motions. Zaha Hadid Architects’ design incorporates a 1,600-seat concert hall and a 400-seat chamber music hall, all burrowed within the undulating surface of the suspended canopy, which will extend above the lobby and enclosed urban square. Within the lobby, massive glazed facades blur the boundary between interior and exterior, calling visitors to experience the artistic spaces within. Above the canopy, a public rooftop terrace overlooks the city’s Church of All Saints. “Russia has been a formative influence on Zaha Hadid Architects’ creative work,” said Christos Passas, project director at Zaha Hadid Architects, in a statement. “From very early in her career, Zaha was attracted to the Russian avant-garde who conceived civic spaces as urban condensers that catalyze a public realm of activity to enrich creativity and community; allowing space itself to enhance our understanding and well-being.” These principles of urban creativity and ingenuity are embedded within the design of the new concert hall, which utilizes a series of public spaces to strengthen the bond of inner-city residents. Sverdlovsk’s Ministry of Construction and Infrastructure Development organized the design competition with the help of the charity for the Ural Philharmonic Orchestra. A 66-story residential skyscraper designed by famed New York architect Robert A.M. Stern is taking shape at 220 Central Park South. The building will be 950 feet tall and will boast park views for most apartments. Many apartments will have floor-to-ceiling glass walls. Classical in design, the building is clad in Alabama silver shadow limestone. A unitized design maximized prefabrication of the enclosure, reducing time spent on site installation. Shop-glazed unitized window assemblies complete the weather-tight system. The windows feature fixed lites, inward-operable hopper vents, thermally-broken custom aluminum frames, and high-performance insulated glass units. 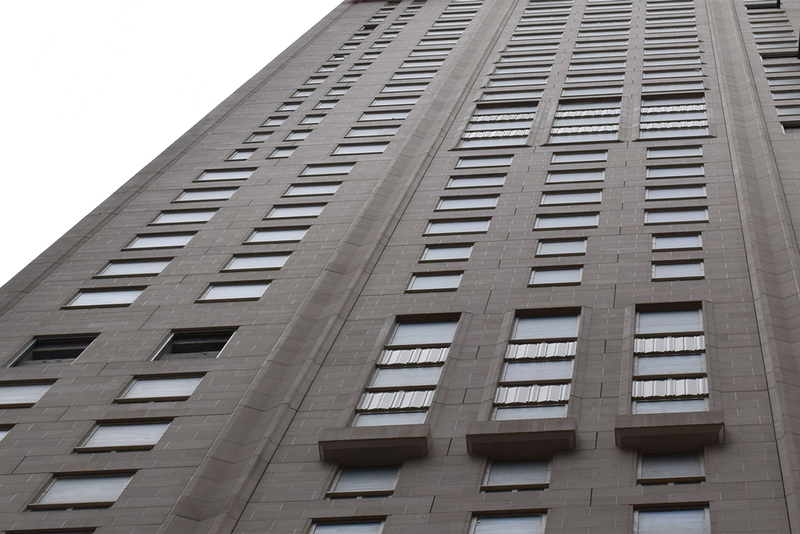 To complement the hue of the limestone, aluminum window frames were coated with AkzoNobel custom formulations, including TRINAR TMC “Nickel Finish,” a three-coat metallic color system that imparts a distinctive, pearlescent finish to metal. 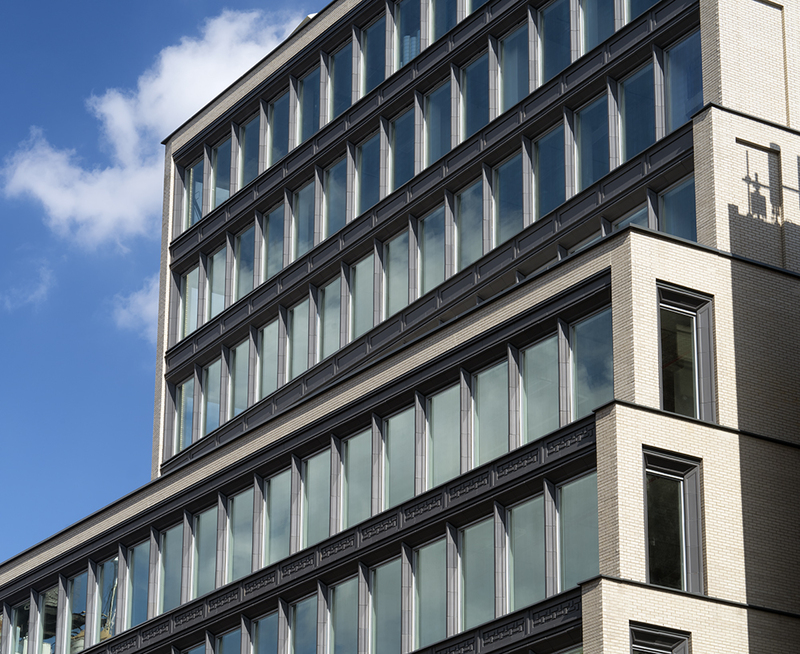 To learn more about how TRINAR®ULTRA can give your building project a contemporary look suitable for the world’s most recognizable buildings, contact AkzoNobel today.